A while ago, I decided to start making information sheets you could print, cut out and stick in your Midori Traveler's Notebook, just like the ones you can get at the Midori site. Today's cut-out file shows UK holidays in 2014. 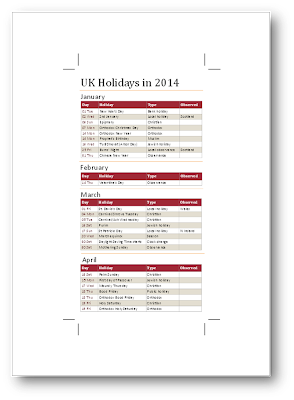 In all, there are 4 pages in this file which collectively list all the major holidays in the UK in 2014. 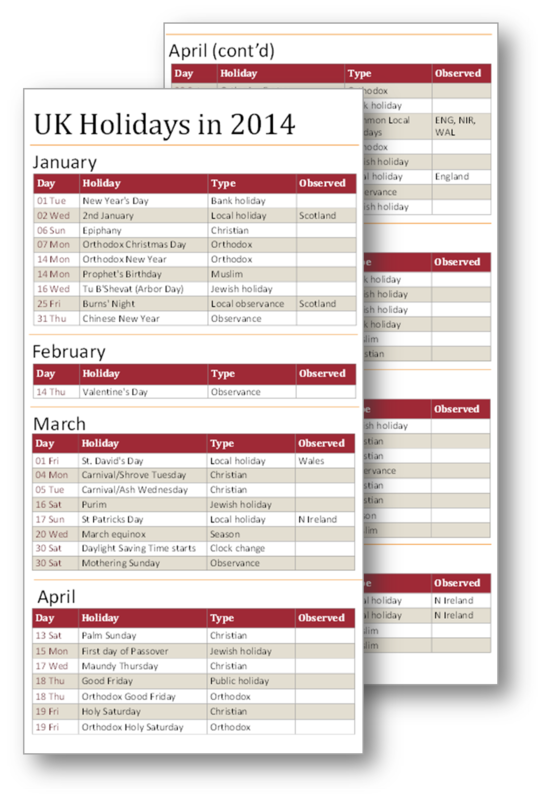 There is space for you to add your own important dates too. Print at full size and cut as indicated (there are printer's crop marks on every page as shown below.) Then simply glue into your notebook insert. I'm intending to make more of these cut-out inserts; please let me know in the comments if there is anything you would like to see included. This would be useful for Filofax Personal and A5 size too! Great idea, although I'm struggling to think of many others that would be useful - the first pages of Filofaxes listing EU Members, clothing sizes, metric/Imperial measures etc. are the obvious ones! Not sure your title is the best for this insert. 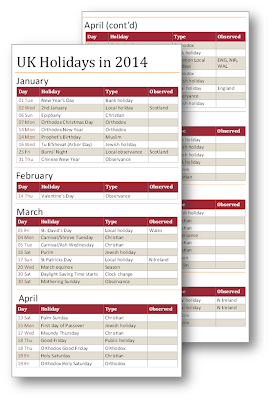 Most of the dates are not holidays at all - either bank, public or local! Even dates such as St David's Day is not a holiday - not even in Wales. "Important Dates 2014" would surely be a better title? There's this one, too, Tim: http://mylifeallinoneplace.blogspot.co.uk/2013/03/new-series-cut-outs-for-midori.html. I haven't made one for the Filofax. But I suspect that by scaling your print you could produce an appropriately sized one from this.